Fall lasted about eight hours this year. A couple weeks ago, temperatures dropped about 20 degrees overnight. Normally, any temperatures above 50s, I would just leave the kids outside. But because it went from 80s to 50s/60s overnight, I decided to bring them in for the winter season. They had no time to gradually acclimate to the cold. I hope the kids survive this winter darkness! I had been talking about visiting Hawaii for years! But it’s just so much easier to watch YouTube vids of other people’s trips, or drive to a local weekend destination than to plan a trip to Hawaii. As much of a homebody as I am, it took but the mere mention of a wedding and I booked the trip, packed up, and was ready to go. If you’re looking for vegan food, stick to the Asian joints. Many traditional American/Hawaiian places also had vegan options due to Asian influences but there were times when I had to settle on a carb turducken (a breakfast of fruit and hash browns on toast). Towards the end of the trip, I was craving sweets (which I rarely do). Not sure how true it is, but I’ve heard that it’s a sign of a protein deficiency. In the end, I was feeling insatiably hungry and weak so I relented and had egg at one breakfast joint. And then I chased it down with a vegan snickerdoodle. Protein and sugar! This was one of the best meals I had during the trip. 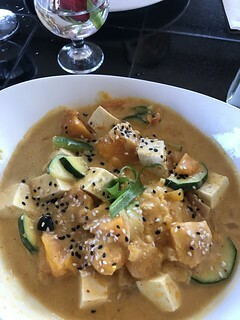 It’s kabocha curry. The fruit is phenomenal. On our second day there, I got myself a cheapo santoku knife so I could cut some Hawaiian pineapples in the hotel room. Their papayas and pomelos were also amazing. Too bad we can’t get them around here easily. Still, I got my fill – three pineapples in a week. Hike to Green Sands Beach – Not an easy hike but the beach at the end of it was such a sweet relief. 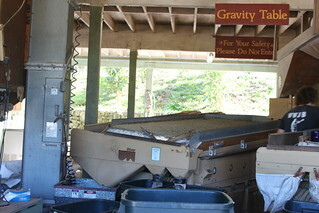 Kona coffee tour – This is like Napa Valley for coffee. But rather than getting sloshed, you get buzzed. Captain Cook’s is such a beautiful area so I still felt relaxed in a chatty way. Place of Refuge (Pu’uhunoa O Honaunau) National Park – A beautiful and historic park where they share the history of native Hawaiians. There’s a wonderful trail here too. Volcanoes National Park – When people say the Earth is alive, this is what they mean. 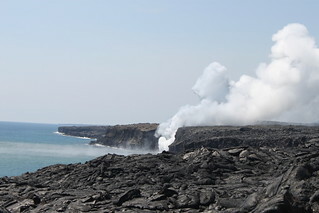 Kilauea is pouring out lava. During the day, it looks like smoke and steam. At night, it’s bright orange red and spurting out. MaunaKea summit tour – Even just on the side of a highway at night, I saw more stars than I ever have. On MaunaKea I saw the Milky Way galaxy for the first time. It’s a breathtaking evening. 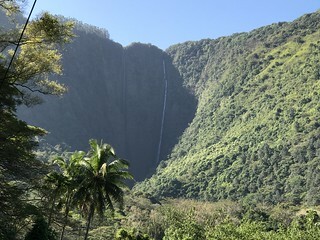 Check out the waterfalls. There are many and none of them are as impressive as say, Niagara or Iguacu, but we went to a few of them and they were pretty. 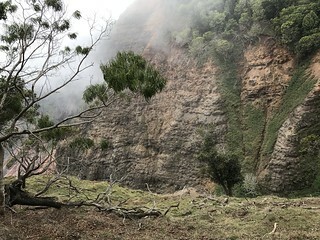 Hike the Kalalau Trail on the Na’Pali Coast – If I did nothing else on this island, this was the one thing I wanted to see – the Na’Pali coastline. It’s breathtaking. 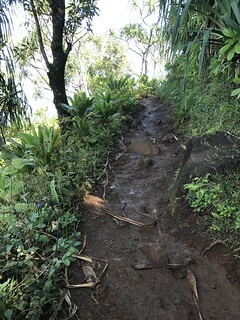 The first section of the hike starts at Ke’e Beach and ends at Hanakapi Beach. We heard later from friends that this was not a very safe trail. I guess ignorance is bliss? To be honest, I was ready to turn around at the 0.25 mile marker. Then I was ready to turn back at the 0.50 mile marker. Somehow, we got to Hanakapi and the way back was easier. In the earlier part of the day, parts of the trail were wet, muddy, and slippery. By the afternoon, much of it had dried. Waimea Canyon – This was the most beautiful hike. It was relatively easy and relaxing under the cool canopy of a forest. Even though I’d say this was the easiest hike we did, I slipped twice. Allerton Botanical Gardens – With a return flight not until 10 PM, this was a nice little something to do. 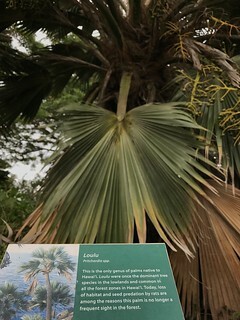 They guide you around the gardens and describe the plants and trees. Hawaii and Kauai’s airports are small. Eat beforehand or bring food. There’s nothing good at the airports. Even the water from the fountains taste funky. Bring your own knife or better yet, just get pre-cut fruit from the grocery store. It didn’t occur to me to do that until after I’d purchased the knife. I now have a crappy santoku knife. Stay on the Hilo side of the island at least for a night or two. 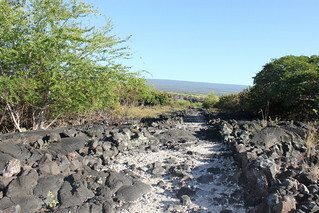 Driving to see volcanoes from Kona is a bit of a trek. Restaurants close early (generally 9 PM). Plan accordingly. We missed dinner a couple of nights because we stayed out to see volcanoes and the stars at MaunaKea. Both worthwhile and I had pineapples on hand, but still, dinner would have been nice. 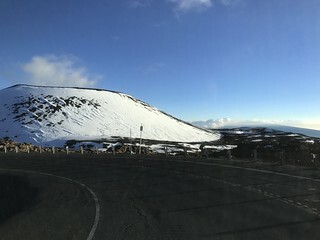 Speaking of MaunaKea, the drive up there is all up hill. There are no gas stations. Fill up your tank before you ascend. We cut it a bit too close. Luckily, on the way down, you barely use any gas. We cruised on neutral for some portions of it. Packing: You don’t need fancy clothes in Hawaii. This isn’t a fancypants posh kind of trip. Plan to get dirty. 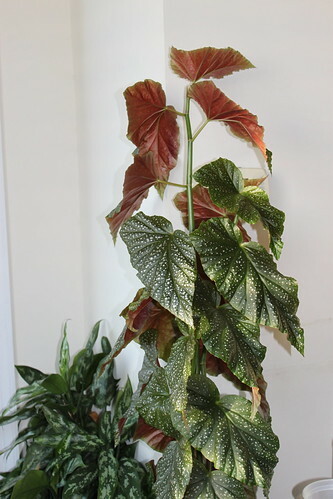 It’s different from the current begonia I have. 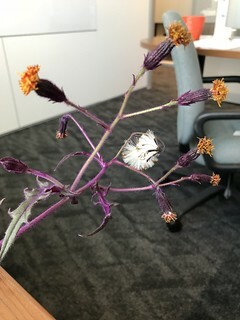 The new one has thicker, fuzzy, almost succulent-like leaves with no variagation. It grows short and squatty. 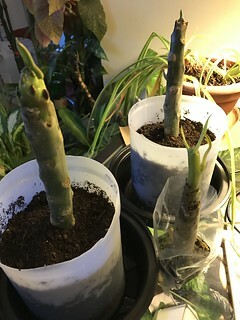 The one I have grows long and tall, has thin, smooth polka-dot patterned leaves. 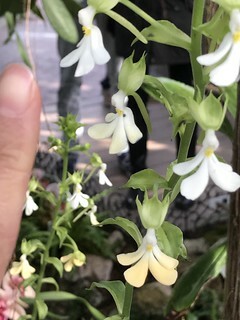 The leaves are smaller too on this new one. Maybe 5-6″ instead of 11″ or so on my old one. Maybe after if blooms I’ll be able to better identify this variety. Beautiful variegation on the leaves. Almost a purply dark green color with some velvety fuzz. 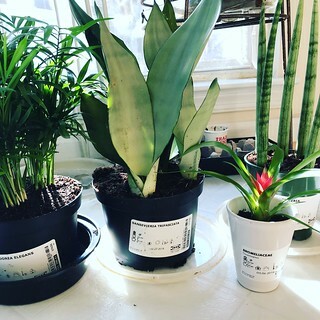 I now have 4 varieties of philodendrons. 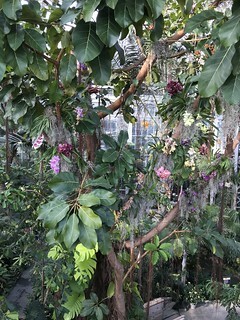 The other two are Philodendron Scandens (Heartleaf) and Philodendron grazielae (brighter green leaves that are almost succulent-like with thicker firmer stems). At least I think it’s an English Ivy. I’ve killed one of these before. 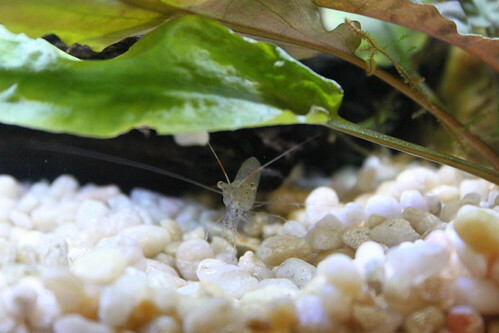 I left it in water to just grow in a vase. 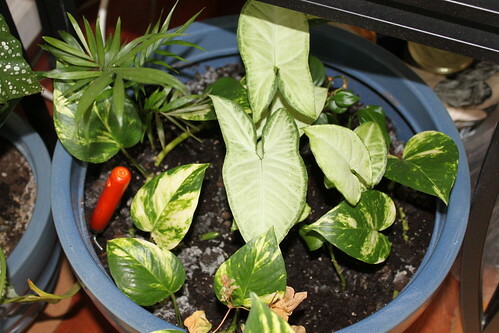 It needs to be potted eventually. Again, I’m relying on Google pictures to help me identify this thing. I’m not totally sure it’s a Silver Bay but I’m quite sure it’s an aglaonema. And this is my third variety of Chinese Evergreen. I love the different leaf variegation on each one. 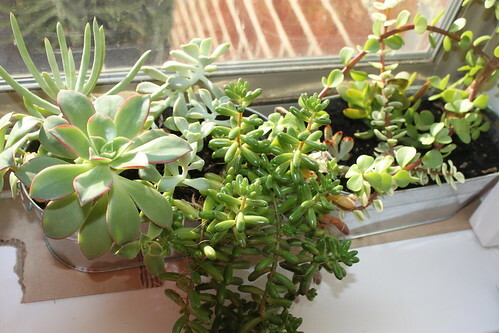 They are beautiful plants and so easy to care for and propagate. Are we fer reals here? There’s a day for appreciating houseplants?? And that day is today? Well slap my pothos and call me Lulu. 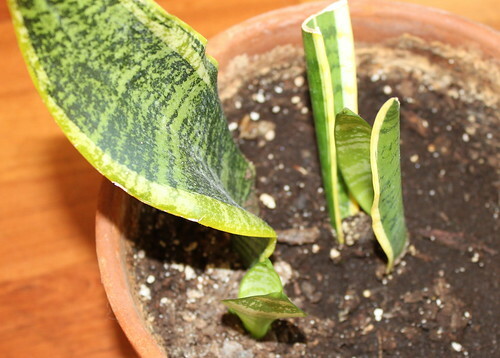 Winter is the toughest time for me in caring for my houseplants. There’s already not enough sunlight as it is even during the warmer months so these plants really have to hang tough for a few months. At the same time I have to adjust my watering habits. I’ve already rotted out a succulent. 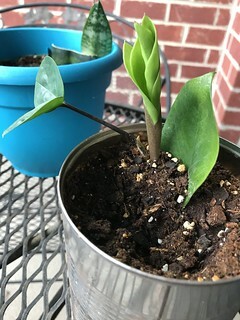 Luckily they’re easy to propagate so I’m hoping to rescue it. 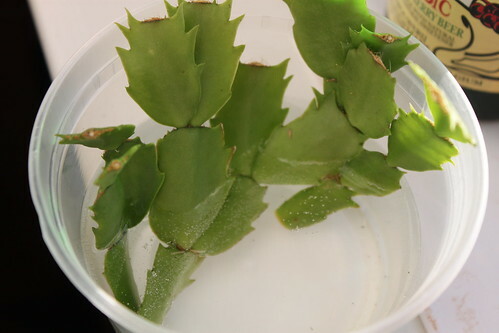 This christmas cactus is my newest planted propagation. There’s a tiny flower bud forming on it already. This weekend I went to a gardening store to look at all the houseplants they have. There were so many I’ve been wanting that they had. 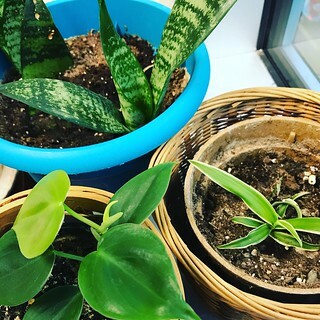 If I had more sunny windows or better yet, a sunroom, I would be in houseplant heaven!